Sonmor muses on the conventions of historical subjects including romantic landscapes, equestrian and marine subjects, and vanitas still-lifes. Sonmor uses these familiar historical practices, though slightly shifting many of their known properties, such as colour or space. The resulting paintings celebrate these historical subjects in today’s culture, capturing the feeling of Northern European still-lifes and Vanitas studies and rendering images in hues and shades of feeling, while still carrying a distinctive contemporary edge. 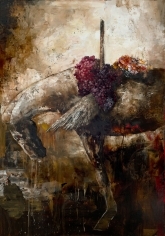 With his horse paintings, he reflects on the effort required to construct and maintain a myth, contemporary or otherwise, Sonmor faces competing vested interests and the rapid flow towards cultural homogeneity. His earnest subjects seem intent on living up to their appointed status and expected image. Born in Lacombe, Alberta, Canada, Kevin Sonmor completed his MFA at Concordia University in Montreal in 1991. Since then, he has exhibited widely across Canada, the US, and more recently, Europe. 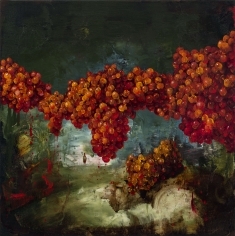 Sonmor has had solo exhibitions in several public galleries and museums, including University of Waterloo, Mendel Gallery in Saskatoon, Art Gallery of Mississauga and most recently, Sherbrooke Museum of Fine Arts in Quebec. In the fall of 2014, Sonmor had a solo exhibition at the Art Gallery of Grande Prairie in Alberta. Sonmor is a recipient of numerous Quebec Council Grants and his work can be found in many private and public collections including the University of Waterloo, Art Gallery of Nova Scotia, the Glenbow Museum and The Government of Canada. 1988 - 91. MFA Concordia University. Montreal, Quebec, Canada. 1983 - 88. The Alberta College of Art and Design. Calgary, Alberta, Canada. Simple Short Stories. The Sherbrooke Museum of Fine Arts. 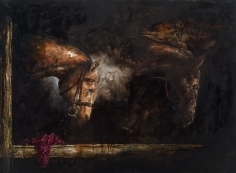 2 person exhibition with France Jodoin curated by Sarah Boucher. Catalogue: Essays by Anthony Collins and Bernard Chase. Lahey, Sonmor, Bartram. The Macdonald Stewart Art Centre. Group exhibition curated by Judith Nasby and Dawn Owen. Failing Gravity. The Art Gallery of Mississauga. Solo exhibition curated by Robert Freeman. The Landscape Perilous. Organized by the Mendel Art Gallery. Solo exhibition curated by George Moppett. Catalogue: Essays by Mark Daniel Cohen and George Moppett. the Robert McLaughlin Art Gallery, Oshawa, Ontario. Marks, Gestures, Symbols. The White Mountain Art Academy. Group exhibition curated by Natalie Olanick. Made in Canada: Contemporary Art From Montreal. University of New York, Plattsburg, New York. USA. Controlled Substance. The Macdonald Stewart Art Centre. Group exhibition curated by Judith Nasby. The Menlove-Goode Collection: Endgames. The Agnes Etherington Art Gallery. Sights of Contention. Organized by the University of Waterloo. Solo exhibition curated by Joseph Wyatt. Catalogue: Essays by David Liss and Joseph Wyatt. the Art Gallery of Algoma, Sault Ste Marie, Ontario. The Word in Canadian Art. The Canadian Centre for Contemporary Art. In the Wilds: Canoeing and Canadian Art. The McMichael Collection. Group exhibition curated by Liz Wylie. The Persistent Tradition: The Canadian Landscape. The University of Waterloo. Group exhibition curated by Joseph Wyatt. Sonmor Paintings. The Niagara Artist Centre. Rethinking Coyote Flats. Gallery Skol. I’m Painting Horses on My Walls. Modern Fuel Gallery. Reflections - Relocations. Truck Gallery. From the Landscape. The Illingworth Kerr Gallery. Ten Years. Modern Fuel Gallery. Kingston, Ontario, Canada. Group exhibition. With Introspection. The Walter Phillips Gallery. G’ddy Up. Newzones Gallery of Contemporary Art. Sunscreen. Newzones Gallery of Contemporary Art. Landscape and Memory. Addington Gallery. The Common Hand. Leo Kamen Gallery. Roland Reese, Kevin Sonmor. Deacon Ulrich Fine Arts. Kevin Sonmor, David Moore, Sunni Mercer. Leo Kamen Gallery. Six Young Painters. Virginia Christopher Gallery. Olanick, Natalie. Kevin Sonmor. (Catalogue Essay: Galerie deBellefeuille, Montreal ‘2002). Liss, David. Sights of Contention (Catalogue Essay:University of Waterloo, Ont. Sept ‘98).